Matt should be able to defeat Ollie in a decent battle. His agility and radar sense will serve him best here against Ollie's arsenal of arrows and other tricks. Ollie will keep him on his toes, but the biggest factor is when Matt closes in on him and it comes down to their hand to hand capabilities. Ollie is good, but he won't stand much of a chance against Matts skill and pressure point attacks. For now I'm saying Ollie because of equipment. He has AOE arrows to counter Matt's agility and to take him down, and in a city setting he can grapple away to create distance between the two if Matt closes the gap. He can fire multiple arrows at once and has fired tactically in the past in order to tag people faster than Matt, like Constantine Drakon. Ollie's trick arrows and unorthodox tactics, combined with the setting, should let him take a majority here. It depends of Ollie's arsenal. If he decides to utilize things such as sonic arrows, then Matt might be screwed. 100 feet apart? No way is Ollie losing this. Matt is a better melee fighter, sure, but Ollie isn't an idiot. He'll recognize that he's outmatched in that area and do his best to create distance between the two, in order to utilize his advantages. And considering the fight takes place in a city, Oliver can grapple up on buildings which Matt will have to climb, in order to get the high ground. He can keep doing this whilst firing trick arrows whilst Daredevil tries to get to his position. Looking forward to this. I'm favouring Daredevil for a majority though since Ollie needs to stay at range to win. Ollie is fast enough on the draw (faster than Deadshot to be more specific) to rain a barrage of AOE trick arrows on Daredevil before he can get within range of attacking Oliver. He uses stuff like explosives, knockout/tear-gas, electric, cryonic, and more all the time, it's literally his trademark. If Matt tries throwing his clubs then that won't work either, since Ollie is a legit arrow-timer and he can either dodge Matt's clubs or shoot them out of the air. I would love to hear a better argument for Daredevil than what was suggested until now. Ollie starts at range, lol. He has the advantage right off the bat. Now since Daredevil is already well known for his plethora of bullet reaction feats, I don't think there is any doubt he can dodge an arrow or even six of them, all thanks to his radar sense and nimbleness. The question here is, will Daredevil be able to close the gap before Ollie resorts to his more lethal options?. The answer is yes. For instance, this is what he can do in terms of movement speed. As you can see, Daredevil senses a sniper on top of a building and immediately runs and closes the distance of 2 blocks, within seconds to a minute most. In all fairness, Ollie is much better than some fodder assassin and will have Matt on his sights whenever he can, but having the speed to cover 2 blocks in a matter of seconds combined with his agility to jump around or stealth around buildings, he will be able to close the distance in no time. Ollie will not be able to use any of his deadlier arrows in CQC and cannot really hang with Matt in that department and he goes down in time. @brucerogers: Who says he wouldnt use those arrows anyways? Matt has tagged people like Cap and Iron Fist with his billy clubs. Hell, he tagged a guy with equal skill and superior senses with a very complicated trick shot. I mean how many sonic arrows does Ollie normally carry? All jokes about unlimited arrows in fiction aside, its not like he has a massive amount to utilize in a random encounter. Plus Matt will hear them coming with his radar sense. @hankscorpio: Hearing sonic arrows is the whole point. That isn't a benefit to Daredevil. @lubub55: I'm saying won't he be able to get far enough from them that it won't become an issue? Surely a sonic arrow has a radius than can be avoided if somebody is fast enough. @lubub55: I have a few questions regarding your post. You say he tagged Drakon using that aforementioned tactic and claim it will be successful with Matt because Drakon is faster than Matt. I mean sure, I can agree on the faster part in terms of combat speed maybe, but Matt has better agility feats and has a better reaction time, thus affording him better avoidance. For starters, Ollie has no clue that he is fighting a blind guy with enhanced senses, thus he is not likely to open with his sonic arrow when he can just start off with normal ones. He's used a sonic arrow on Deadshot to incapacitate him, when he knows for a fact that Floyd isn't blind. He doesn't reserve them exclusively for people with enhanced senses. He also uses things like glue arrows as an opening move, which can stick Matt in place or blind people who catch it. If that happens, Matt will either have to fake being blinded like he did against Hawkeye in which case the arrow will still get the same result, or carry on anyway and then his blindness will be given away, and Ollie will use a sonic arrow. Hell, one can even argue that he may not even get a chance to use his trick arrows before Matt closes the distance and beats him down. 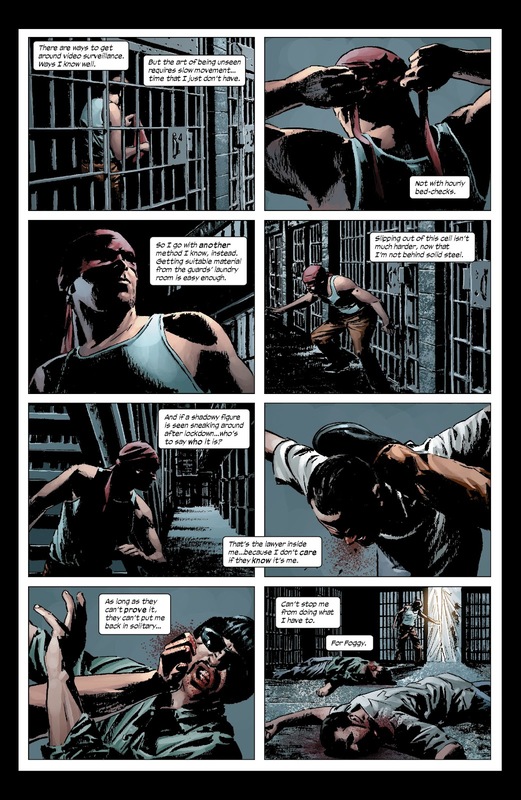 The question here is, will Daredevil be able to close the gap before Ollie resorts to his more lethal options?. The answer is yes. For instance, this is what he can do in terms of movement speed. In all fairness, Ollie is much better than some fodder assassin and will have Matt on his sights whenever he can, but having the speed to cover 2 blocks in a matter of seconds combined with his agility to jump around or stealth around buildings, he will be able to close the distance in no time. Plus, if Ollie sees somebody running that fast towards him, he'll try and impede his progress with things like electrical and explosive arrows, which have an AOE which Matt can't avoid. Now since Daredevil is already well known for his plethora of bullet reaction feats, I don't think there is any doubt he can dodge an arrow or even six of them, all thanks to his radar sense and nimbleness. Here's how casually Constantine Drakon can react to arrows. And here's what happened when Drakon faced Oliver Queen in a close quarters environment, performing a similar feat to what you mentioned Daredevil can do later in your post. He's activated trick arrows up close before, and he's also used flechettes as melee weapons and distractions for doing other things up close. I can provide scans for those if you'd like. He is much more likely to open with the regular ones first. Matt can close the distance before he decides to use them. Ollie regularly opens up with trick arrows. Left to right: electric, explosive, knockout gas, tear gas, glue, net. There are more of course. 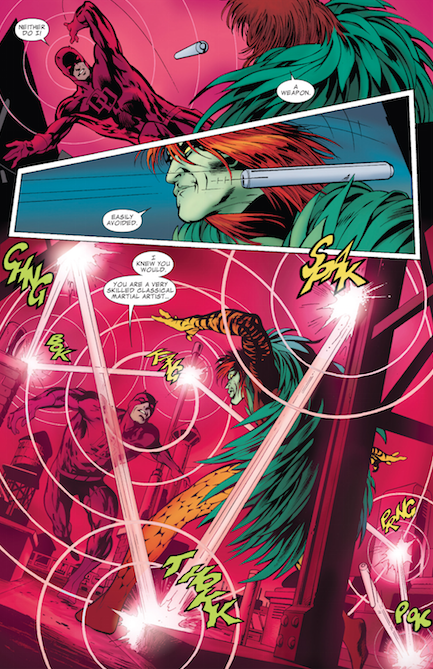 In the first one he shows that he is faster on the draw than Deadshot (Deadshot pulled his guns before Ollie pulled his arrows out of his quiver, but he still fired before Deadshot did, which forced Deadshot to shoot his arrows out in mid air instead of shooting Ollie himself), and in the second he fires 2 arrows so that the tail of the first is in line with the head of the second. If I calculate this feat it will show that Ollie can fire faster than a machine gun, but I won't do it because that's BS. All in all, yeah, Ollie wins a very solid majority here. @lubub55: He's used a sonic arrow on Deadshot to incapacitate him, when he knows for a fact that Floyd isn't blind. He doesn't reserve them exclusively for people with enhanced senses. He also uses things like glue arrows as an opening move, which can stick Matt in place or blind people who catch it. If that happens, Matt will either have to fake being blinded like he did against Hawkeye in which case the arrow will still get the same result, or carry on anyway and then his blindness will be given away, and Ollie will use a sonic arrow. And what makes you think Matt is just going to stand there idly while Ollie aims the arrows at the top of the building, fires them and ascends?. Even if I buy that Ollie can someone shoot arrows while scaling a building, his aim and speed is not going to be the same as it would, if he were grounded. Seriously, one trick shot from the billy club to Ollie's skull will stop him from climbing the building. If you want his trick shot feats, I will happily provide them. And like I said, Matt is not going to just Leeroy Jenkins his way to closing the gap. He has plenty of buildings to stealth and climb around. Sure he can react to arrows, but Ollie has used unorthodox tactics against arrow timers like Red Hood and Constantine Drakon. That's the thing though, Jason and Drakon aren't Daredevil and they don't have his powers to give him nigh superhuman reaction time. You serious?. And you think Matt can't jump above and even catch the arrow if he feels like it? This is a rather vague statement. What trick arrows?. How is he going to get the environment to favour him against a guy who has a 360 degree awareness and enhanced senses? He's tagged people faster than Matt, so just being an arrow timer isn't enough. Matt is far more than an arrow timer and what faster people are you talking about?. Drakon, like I said, is faster in combat speed but in reaction time and agility?. What has he done to make him superior? A flashbang arrow isn't going to work on Matt for obvious reasons and before you bring up the Hawkeye fight (where Matt pretended to be blind), understand that he was doing it in part to protect his secret identity. Those stipulations have no bearing here and the moment a flashbang arrow is pulled, Matt will just punch his lights out without breaking stride. And to be frank, I fail to see how the second scans are relevant at all given that Matt is not going to attack him with an open mouth like a doofus. Not that Ollie will be able to tag Matt with that in close quarters anyways. Nice, but rapid fire spamming projectiles did not save people like Bullseye from getting beaten up in close quarters so Ollie isn't going to fare any better. It actually will work, reason being that flashbangs don't only blind you but also make your ears ring, which is, as we all know, Matt's Achilles's Heel. Matt is not going to just Leeroy Jenkins his way to closing the gap. Well 22 votes is a decent number already IMO. But you do have a point with this. That's a great feat for him sure, but Matt has tagged people like Cap and Iron Fist with trick shots and these two are bona fide bullet timers. Heck, Danny has caught a bullet with his barehands from behind and even he was tagged by the billy club. Why is Ollie going to get lucky all of the sudden? Especially when DD can do this with his billy club. And keep in mind that that guy in question, Dominic Destine, had move reading abilities better than Matt himself. Cool feats, but the problem is, that they Matt is not going to be corned to a wall for stuff like the glue arrow to work. The rest also can be averted with him just smacking them away, jumping above them or using the environment for cover. And you think a mere net arrow is going to stop someone who can do THIS? See the thing is, Matt isn't going to exchange fire with him. He is going to use his radar sense and agility to navigate around the city and get to Ollie via stealth or otherwise. The zipline thing can easily be averted by a billy club throw. Matt is weak to sound, not his ears ringing on it's own. So this is hardly going to have any discernible effect. Regardless, he has handled gunshot in close range perfectly fine, thanks to his ability to tune out sounds. Technically that thread has different conditions. I end up locking my battle of the week threads at the end of the week regardless. Battle of the week threads are different conceptually than regular threads. That's a great feat for him sure, but Matt has tagged people like Cap and Iron Fist with trick shots and these two are bone fide bullet timers. Heck, Danny has caught a bullet with his barehands from behind and even he was tagged by the billy club. Why is Ollie going to get lucky all of the sudden? Because neither Danny nor Steve have the means to shoot the clubs out in mid-air. Ollie does and he has reacted to arrows, which move far faster than Matt's clubs. Oliver literally has to reach his limits fighting DD and to pull a win but DD's entire skillset and abilities are straight counters for his own. Even with Oliver's own AOE arrows and various trick arrows are all only going to be completely useful if he has knowledge beforehand. He'd auto win with a Sonic arrow but wouldn't know he needs it, a Explosive Arrow could do the trick but Ollie won't just outright kill him and refuse to use that force, and before Ollie realizes he needs to try being a bit more aggressive Matt is already in his face with superior h2h skills and pressure points. I'd argue Oliver has never really gone against someone like Matt while one of Matt's enemies have a very similar skill set and is arguably more deadly in some areas. When matt closes the distance Oliver can't do much to get his one advantage back and will be down in a matter of seconds. Now I love Ollie but Matt is not only a class above him but a great counter to the skills of a Archer. Ollie uses explosives all the time. He has many low-yield, non-lethal explosives. Ollie uses non-lethal trick arrows as an opening move ALL THE TIME, and it isn't only limited to explosives and sonic arrows, but also tear gas, knockout gas, electric, cryonic and others. @the_red_viper: I never said he only had those arrows but I don't feel he'll use them before DD closes the distance, not to mention most of those arrows he'll dodge. The only one that you mentioned that could cause some trouble is the knock out gas which DD will defiantly be on the move to dodge . Ollie is a master archer but like I said I feel he's going against an opponent whose own skillset and meta human powers counter his own hard. Could I get some scans of Oliver starting with one of his battles with a completely new adversary that he knows nothing about with one of his non lethal Explosive arrows? You say he tagged Drakon using that aforementioned tactic and claim it will be successful with Matt because Drakon is faster than Matt. I mean sure, I can agree on the faster part in terms of combat speed maybe, but Matt has better agility feats and has a better reaction time, thus affording him better avoidance. I've provided some arrow timing feats to go along with that. The point is that Ollie can tag people who are easily fast enough to react to arrows normally. You are also neglecting the fact that given that they are fighting in a city, Matt has tons of options for stealth or cover. And what makes you think Matt is just going to stand there idly while Ollie aims the arrows at the top of the building, fires them and ascends? Even if I buy that Ollie can someone shoot arrows while scaling a building, his aim and speed is not going to be the same as it would, if he were grounded. Seriously, one trick shot from the billy club to Ollie's skull will stop him from climbing the building. If you want his trick shot feats, I will happily provide them. This is a fun discussion so far. He used them against normal humans, so he wouldn't have risked a lethal explosive. There's more if you want. And he opens with trick-arrows all the time, not limited only to explosives. See post 30 in this thread. The gas can't really be dodged, as you can see in post 30 it needs only to pass by him for a split second in order to do the trick. Also the tear-gas spreads across a very large area, and he can fire a bunch at once. Matt surpasses ollie in almost every category. The only thing that Ollie has going for him is gear which I don't see DD having a problem of dodging at all.